After last week’s short update about the last tranche of papers from the European Space Agency’s Planck Mission it’s time for another short update about a piece in Nature (by David Castelvecchi) that explains how researchers are moving to smaller projects studying different aspects of the cosmic microwave background. Much of Davide’s piece echoes discussions that were going on at the meeting I attended in India last October, but things have moved on quite a bit since then at least as far as space experiments are concerned. In particular, the proposed Japanese mission Litebird has been shortlisted for consideration, though we will have to wait until next year (2019) at the earliest to see if it will be selected. An Indian mission, CMB-Bharat, has also emerged as a contender. 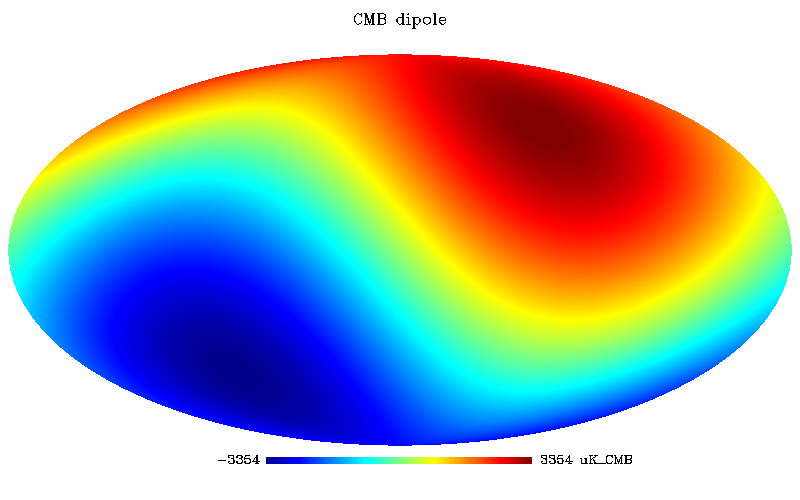 While the end of Planck closes one chapter on CMB research, several others will open. These are likely to focus on polarization, gravitational lensing and on cosmic reionization rather than refining the basic cosmological parameters still further. 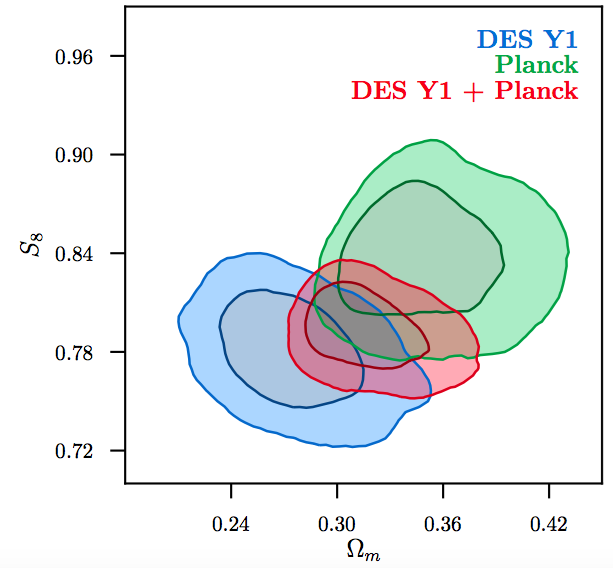 Here are two interesting plots that I got via Renée Hložek on Twitter from the recent swathe of papers from Planck The first shows the `tension’ between Planck’s parameter estimates `direct’ measurements of the Hubble Constant (as exemplified by Riess et al. 2018); see my recent post for a discussion of the latter. 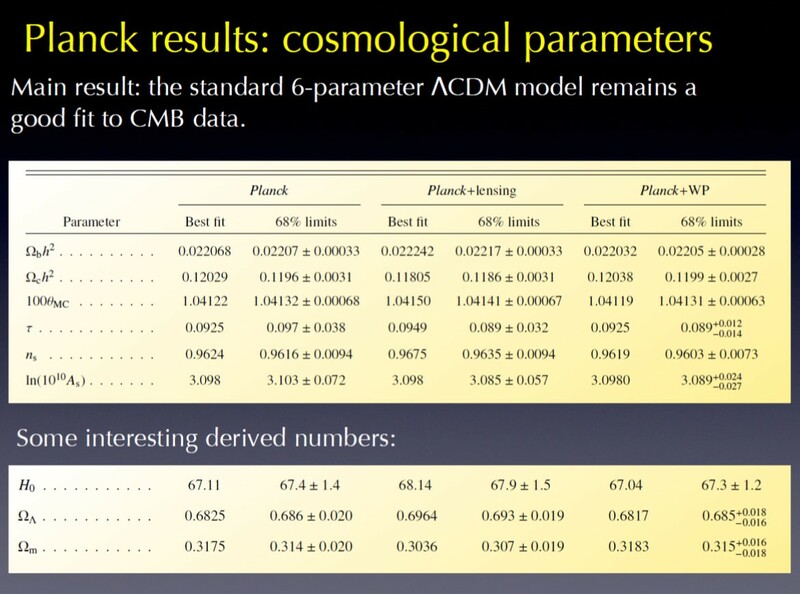 Planck actually produces joint estimates for a set of half-a-dozen basic parameters from which estimates of others, including the Hubble constant, can be derived. 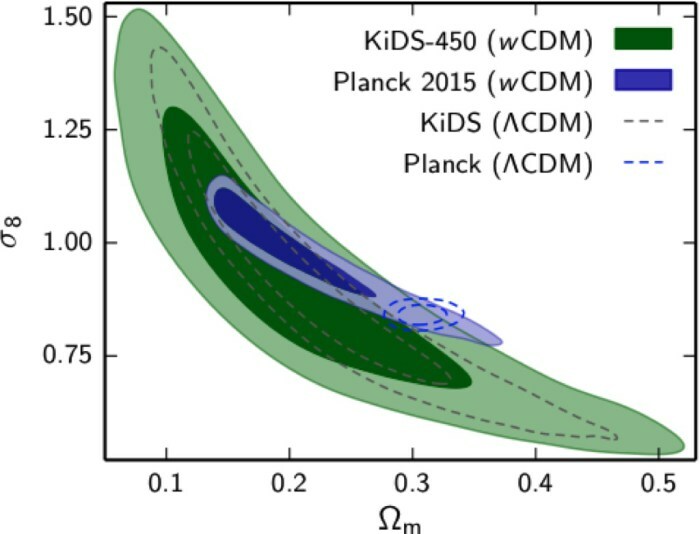 The plot below shows the two-dimensional region that is allowed by Planck if both the Hubble constant (H0) and the matter density parameter (ΩM) are allowed to vary within the limits allowed by various observations. 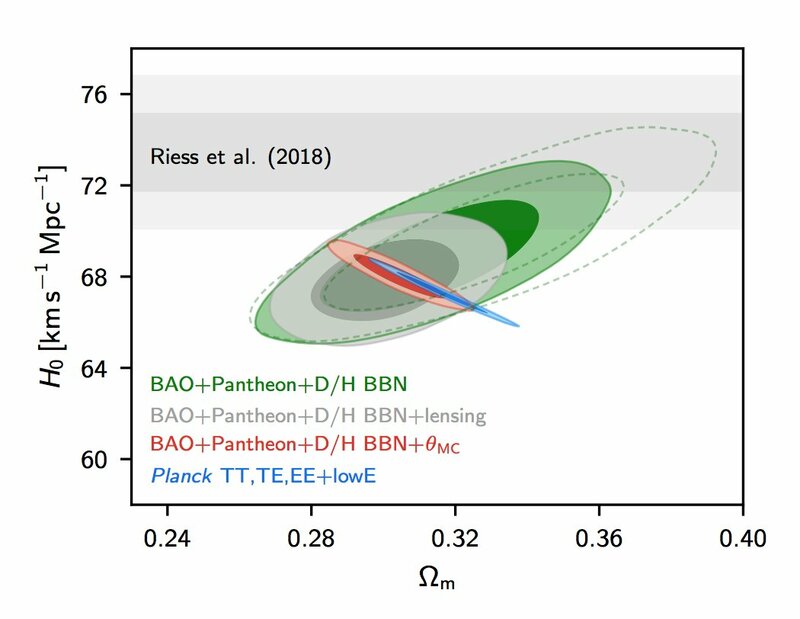 The tightest contours come from Planck but other cosmological probes provide useful constraints that are looser but consistent; `BAO’ refers to `Baryon Acoustic Oscillations‘, and `Pantheon’ is a sample of Type Ia supernovae. 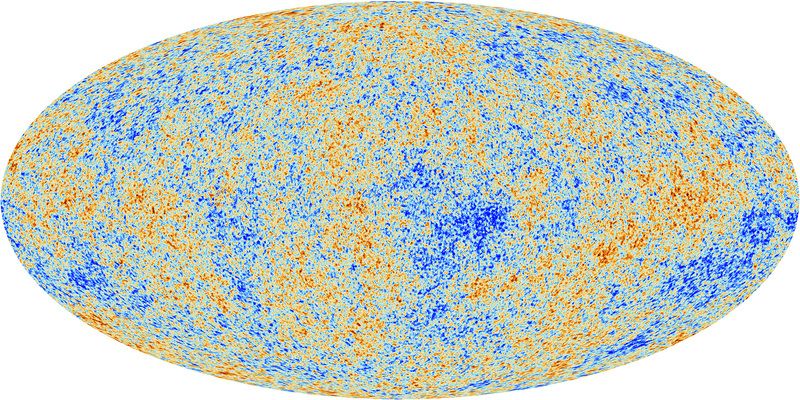 You can see that the Planck measurements (blue) mean that a high value of the Hubble constant requires a low matter density but the allowed contour does not really overlap with the grey shaded horizontal regions. For those of you who like such things, the discrepancy is about 3.5σ.. The solid line shows how the Hubble `constant’ varies with redshift in the standard cosmological model; H0 is the present value of a redshift-dependent parameter H(z) that measures the rate at which the Universe is expanding. You will see that the Hubble parameter is larger at high redshift, but decreases as the expansion of the Universe slows down, until a redshift of around 0.5 and then it increases, indicating that the expansion of the Universe is accelerating. 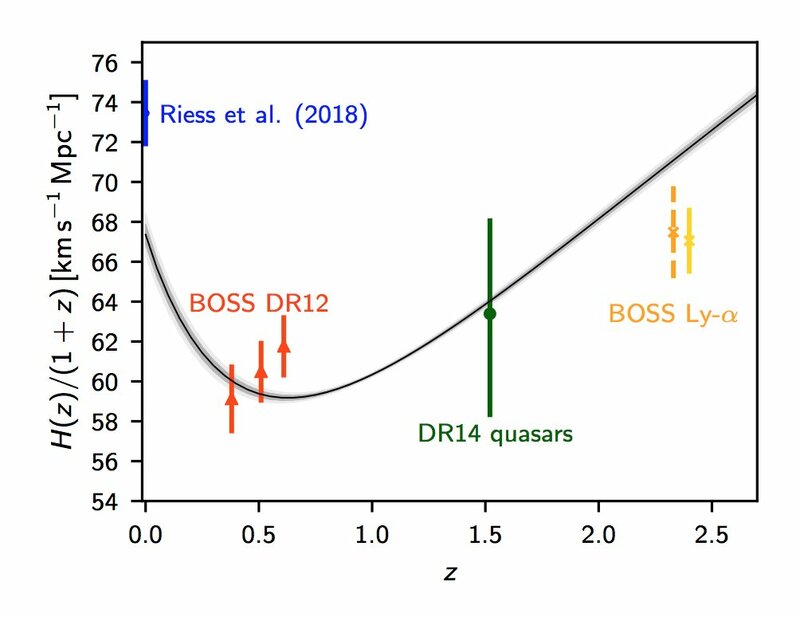 Direct determinations of the expansion rate at high redshift are difficult, hence the large error bars, but the important feature is the gap between the direct determination at z=0 and what the standard model predicts. If the Riess et al. 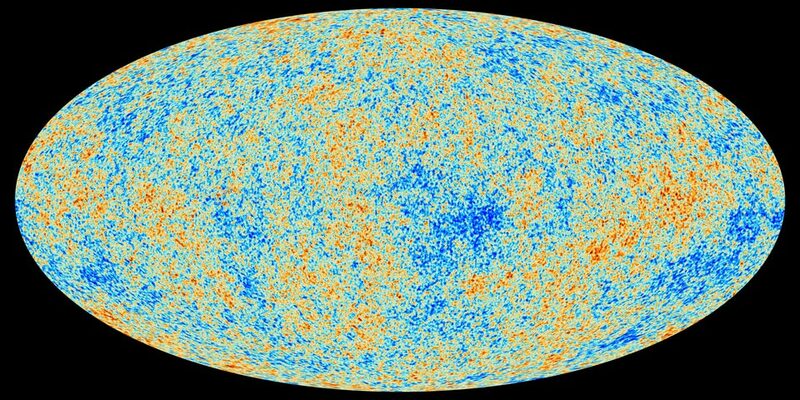 2018 measurements are right, the expansion of the Universe seems to have been accelerating more rapidly than the standard model predicts. So after that little update here’s a little poll I’ve been running for a while on whether people think this apparent discrepancy is serious or not. I’m interested to see whether these latest findings change the voting! Well, they’ve been a little while coming but just today I heard that the final set of a dozen papers from the European Space Agency’s Planck mission are now available. You can find the latest ones, along with the all the others, here. This final `Legacy’ set of papers is sure to be a vital resource for many years to come and I can hear in my mind’s ear the sound of cosmologists all around the globe scurrying to download them! I’m not sure when I’ll get time to read these papers, so if anyone finds any interesting nuggets therein please feel free to comment below! I forgot to mention last week that the 2018 Gruber Prize for Cosmology has been awarded to the Planck team, and its Principal Investigators Nazzareno Mandolesi and Jean-Loup Puget. For more information about the award and the citation, see here. This annual prize is worth $500,00; the two PIs will get $125,000 each and the rest divided among the team. I’m not sure whether this means the Planck Science Team (whose membership is listed here or the entire Planck Collaboration (which numbers several hundred people) but regardless of whoever gets the actual dosh, this award provides a good excuse to send congratulations to everyone who worked on this brilliant and highly successful mission! UPDATE: 14th May 2018. Jean-Loup Puget has also been awarded the Shaw Prize for Astronomy.